Contact reports are the unsung heroes of the fundraising process. Short summaries written by fundraisers about their interactions with donors, they function like a diary, and together they form a record of the long-term relationships between the organization and its donors. Last year, Dr. Sara Konrath and I read 572 fundraiser contact reports. Why? For science, that’s why! Let me back up just a bit. Americans are an extraordinarily generous people. According to Giving USA 2018, individuals gave over $320 billion to charity in 2017, and many if not most of these gifts are asked for in person. We know quite a bit about what motivates different donors to give, but we know very little about fundraiser behavior and how it influences donors’ giving. What IS available are studies on fundraiser characteristics. All of these describe fundraisers as, among other things, socially skilled and empathic. 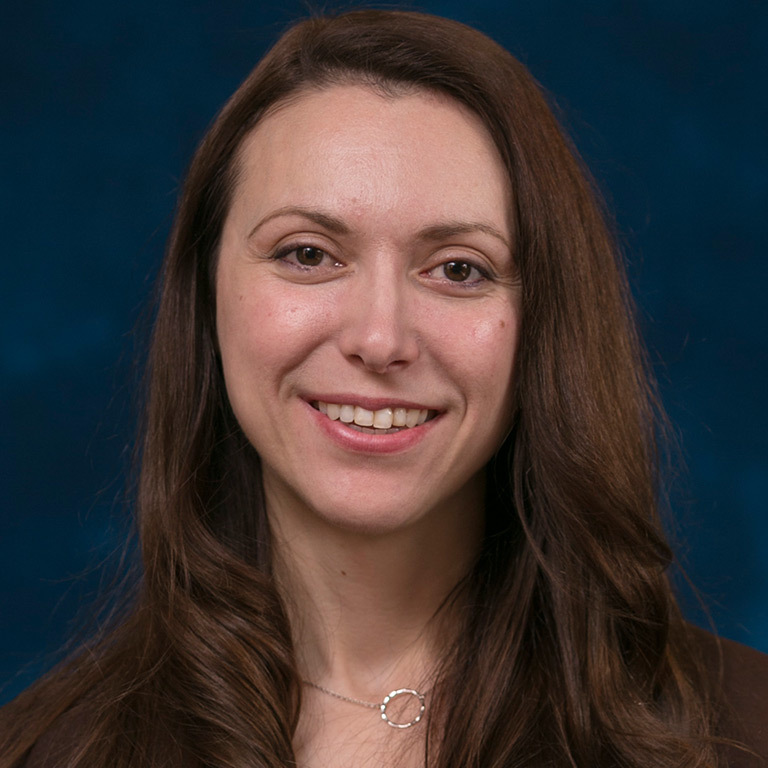 There is evidence that in some professions, like medicine and psychotherapy, practitioner empathy (or a warm bedside manner) is linked with better health outcomes for patients and clients. Although we have yet to hear about a fundraiser literally saving a donor’s life, we did wonder if fundraiser empathy could be linked to desirable outcomes for donors in similar ways. But first, we needed to know whether we could actually measure fundraiser empathy. This is what brought us to contact reports, currently the main existing evidence of the interactions between donors and fundraisers. 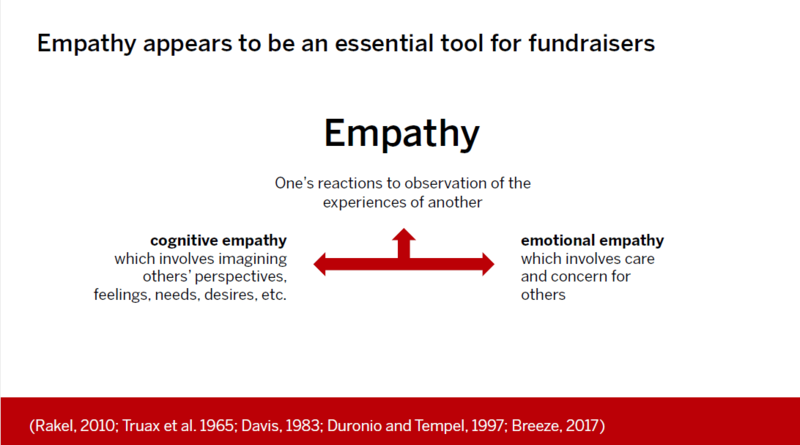 We developed a method to dissect our fundraisers’ writing to extract clues about their empathy levels, and we then compared this to the respective donors’ giving. We also looked whether these measures differed by donor characteristic and type of interaction. For example, are phone calls different from letters? YES they ARE! When writing directly to the donor in the form of emails and letters, fundraisers used more social language and showed higher levels of emotional empathy and expressions of care. 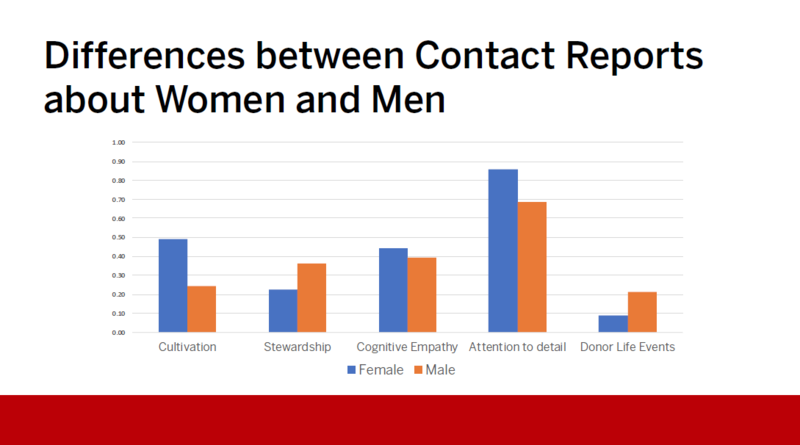 Fundraisers writing about phone interactions with the donor used more analytical language and cognitive empathy—the intellectual process of imagining the needs, desires, and perspectives of the donor. Overall, we found a small, but statistically significant correlation between cognitive empathy (the intellectual process of understanding another’s perspectives, needs, and desires) and cumulative giving. This could mean that when fundraisers look out for the donors’ interests, this makes donors give more. However, it could also mean that when donors give more, fundraisers are more likely to look out for the interest of the donor. It’s also possible that a third, unknown factor explains both. This is an interesting finding, and when we sliced the data based on donor gender, some similarly interesting findings emerged. 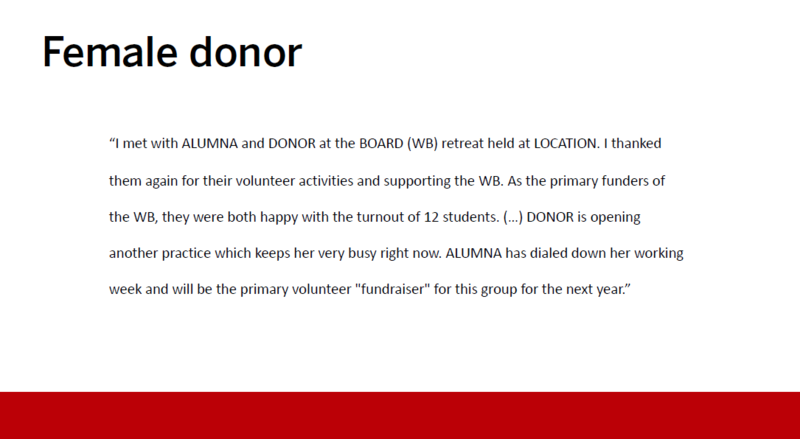 Fundraisers seemed to treat the 33 higher education donors in our sample similarly regardless of the donors’ gender. For example, fundraisers spent as much time asking women for gifts as they did men, and were as likely to express gratitude to women as they were to men. However, when we looked more closely at the individual activities reported by the fundraisers, we found that fundraisers reported twice as many cultivation activities for women than for men, and they reported 33 percent more stewardship activities for men than women. In other words, women seemed to be involved at ever-increasing levels as volunteers and leaders, but received fewer tangible benefits. Although men were less involved as volunteers and leaders, they did receive more tangible benefits, primarily in the form of tickets to varsity athletic events. Linguistic analysis also revealed that fundraisers were slightly more likely to refer to their male donors in the third person, were more likely to add details of life events (such as kids going to college, divorces, vacations, etc. ), and wrote about money more when writing about the men they met on fundraising calls. On the other hand, fundraisers wrote more about motivations when describing their interactions with women. The explanation for these results could tell us a lot about the fundraising profession and the nature of the relationship between fundraisers and donors. Our data provides further evidence for the idea that women and men have different motives, needs, and desires when it comes to their philanthropy. But is the emphasis on cultivation for women donors and stewardship for men donors driven from donors themselves, or from fundraisers? 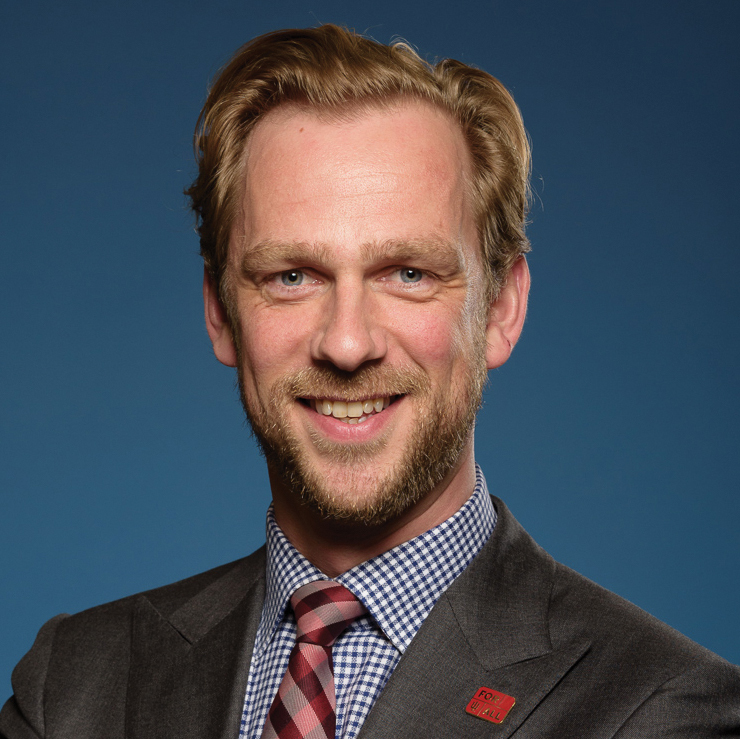 Could it be the result of unconscious bias from the fundraiser to engage their donor in what they perceive as the right activities for their gender? Worse, could it be the result of conscious bias that makes them do so? 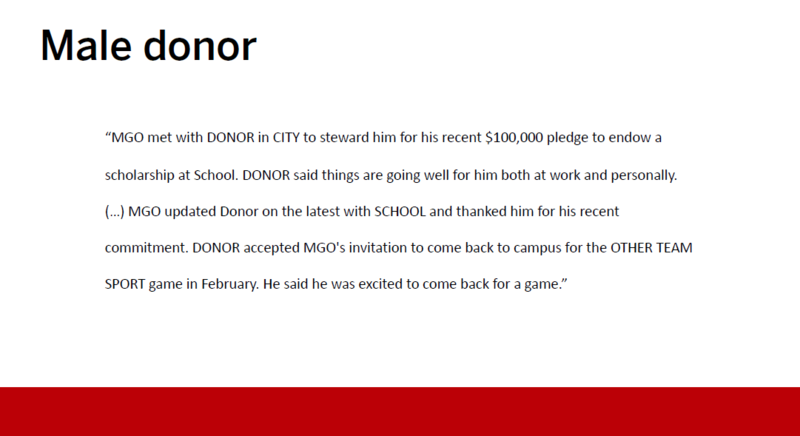 We would find it very surprising if this were true, especially since women make up a majority of major gift fundraisers in higher education, and because the relationships between major gift donors and their fundraisers are so highly individualized.